Salmoneus wrote: Ach, damn it, now I'm working it out. I'll probably not show you mine until you've done your version, though. Question: do you have the same obliquity (axial tilt) as earth? More or less, yeah The year's a bit longer at 395.4 (Earth) days, (the Yantas day is about half an hour longer than ours, so its year is 385.76 of Yantas' days long) orbiting its star at a distance of 1.08 AU. The star is 1.065 solar masses with a luminosity 1.165 times that of Earth, but the apparent luminosity on Yantas is 1.008 times that of the Sun's at Earth with an apparent size of 0.961 times that of the Sun's at Earth. So, basically, everything's more or less the same on the surface of the planet, with the year being a bit longer. On moons: I'm no physicist, but I wouldn't think it would make any difference, no. The Moon is already about as big a moon as a moon can be, but it's never mentioned in discussing climate, I don't think. Two smaller moons shouldn't be able to have any dramatic effect, I wouldn't have though. ...incidentally, I think IRL the mountains would be a lot bigger than you've indicated. Look how much of Asia is dominated by the foothills of the Himalaya, for instance. Yeah, I've been thinking that I should work on the mountains a bit more. They just don't seem... mountain-range-y... enough The map I've got so far has almost all mountain ranges appearing as almost gradual slopes, peaking in a few places in the middle before sloping back down, but looking at examples of real-life mountains on Earth, there are a lot more examples of mountain ranges sloping upwards, but almost in a uniform manner, increasing in height as you move closer to the peaks, regardless of where along the length of the range you actually start. I think, generally, I've got too few peaks and too many low-lying mountains. Also, some work on the orbit of Yantas around its parent star, Italva, and the orbit of it's two moons Kadyura, and Hwestun. Italva has a mass of 1.065 solar masses (making it a G1 star), with a diameter equivalent to 1.033 times that of our Sun. It has a luminosity of 1.165 times that of our Sun and an effective temperature of 5950.965K. Yantas orbits Italva at a distance of about 1.075 AU for about 1.08 Earth years (394.47 Earth days), with a sidereal day of approximately 24hrs 40mins (1.019 times that of Earth), making Yantas' year 386.925 Y-days long. Italva has an an apparent luminosity of 1.008 and an apparent size of 0.961 times that of the Sun as seen from Earth. The first moon, Kadyura, orbits Yantas 33.471 times a year, making one complete orbit every 11.56 Y-days (11.8 Earth days) with a semi-major axis of 219,788km, an eccentricity of 0.013 and an inclination of 4.39°. It has a mass of 0.3 lunar masses and a diameter of 2326km. The second moon, Hwestun, orbits Yantas 9.321 times a year, making one complete orbit every 41.511 Y-days (42.3 Earth days) with a semi-major axis of 514,656km, an eccentricity of 0.11 and an inclination of 1.97°. It has a mass of 0.8 lunar masses and a diameter of 3226km. Hwestun's reaches it's lowest point below the equator at roughly 190 anti-clockwise of Kadyura's highest point above the equator (that is not to say that Hwestun reaches it's lowest point when Kadyura reaches its highest point). I haven't figured out the effects these moons will have on tides yet, or how large they would appear in the sky, but at least one simulation suggests that the two orbits are stable. This is as far as I've gotten so far (thanks to work getting in the way of my hobbies! ). I've only managed to get as far as the northern summer as of yet, but I thought I'd post my progress so far to see if I'm at least on the right track (since works getting in the way a bit, it seemed to make more sense to post the little bit I have so far, rather than spend weeks (possibly months) working on this only to find out I've done it wrong . Italva has an angular size of 30.611 minutes (as mentioned above, 0.961 times that of the Sun as seen from Earth). Kadyura has an angular size of 36.381 minutes, roughly 1.170 times the apparent size of Earth's Moon as we see it, and 1.188 times that of Italva. Hwestun, however, has an angular size of 21.549 minutes, roughly 0.694 times the apparent size of Earth's Moon as we see it, and 0.704 times that of Italva. Further, Kadyura goes from one full moon to the next every 11.916 Y-days, with a total of 32.471 phases per year. Hwestun, on the other hand, goes from full moon to full moon every 46.500 Y-Days, with a total of 8.321 phases per year. Kadyura thus goes through 3.902 phases for every one phase Hwestun goes through. P = density of body. Perhaps someone else might be able to advise me here? What's the problem you're having, exactly? Geoff seems to put it quite straightforwardly: the magnitude of the tide at a point is equal to the density of the tide-causing body multiplied by the cube of the body's apparent diameter as seen from that point. On temperatures: well, first of all I have a confession. Doing temperature first and then pressure doesn't work. On the other hand, doing pressure first and then temperature also doesn't work, because both affects the other. Climates are hard - to do it properly, you need supercomputers. But hopefully it's good enough if you just do an iteration: temperature, then pressure, then return to temperature (because high pressure (clear skies) will mean more extreme temperatures and low pressure (cloudy skies) will moderate temperatures), and then pressure. These iterations will probably only be relevent in a few extreme cases, like over your deserts and rainforests. Second thing: for my attempt at simulating it, I'm assuming more mountains than you've drawn. At the very least I'm assuming plateaus and secondary mountain chains in southeast Hungas north of Mistaya and northeast Arenda west of Konyur. Third: I think you need more variation in temperature. OK, so the greatest heat in midsummer isn't going to be all the way up at 23.5 degrees, because it takes time to warm up even the land, but you've got it around zero! And then the secondary changes over land will be even greater - the northern extremity of Siberia is the same temperature in summer as Iraq or Arizona in winter. Salmoneus wrote: What's the problem you're having, exactly? Geoff seems to put it quite straightforwardly: the magnitude of the tide at a point is equal to the density of the tide-causing body multiplied by the cube of the body's apparent diameter as seen from that point. So, for example, assuming a similar density for Italva's two moons as Earth's Moon, Kadyura (apparent size: 1.170 times that of the Moon) and Hwestun (apparent size: 0.694 times that of the Moon) would cause tides 1.602 times and 0.334 times that of Earth's Moon respectively? Salmoneus wrote: On temperatures: well, first of all I have a confession. Doing temperature first and then pressure doesn't work. On the other hand, doing pressure first and then temperature also doesn't work, because both affects the other. Climates are hard - to do it properly, you need supercomputers. But hopefully it's good enough if you just do an iteration: temperature, then pressure, then return to temperature (because high pressure (clear skies) will mean more extreme temperatures and low pressure (cloudy skies) will moderate temperatures), and then pressure. These iterations will probably only be relevent in a few extreme cases, like over your deserts and rainforests. Salmoneus wrote: Second thing: for my attempt at simulating it, I'm assuming more mountains than you've drawn. At the very least I'm assuming plateaus and secondary mountain chains in southeast Hungas north of Mistaya and northeast Arenda west of Konyur. Salmoneus wrote: Third: I think you need more variation in temperature. OK, so the greatest heat in midsummer isn't going to be all the way up at 23.5 degrees, because it takes time to warm up even the land, but you've got it around zero! And then the secondary changes over land will be even greater - the northern extremity of Siberia is the same temperature in summer as Iraq or Arizona in winter. The July one is wrong. Click wrote: The July one is wrong. For...? Temperature or air pressure? Either way, Sal's pretty much established that that's the case, but simply saying something's wrong doesn't really help anyone correct mistakes. So, for the sake of clarity, why is it wrong? 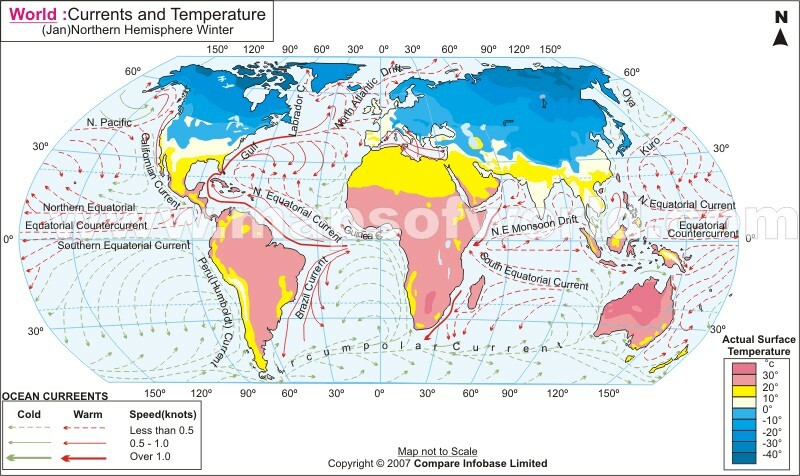 I apologise for not saying my point, but it still holds that the map is very wrong with regards to temperature. For example, it indicates that July temperatures exceed 20°C in entire mainland North America except in some parts of Mexico and northwest USA, and that average temperature in South America abruptly falls from 20°C to less than 10°C. 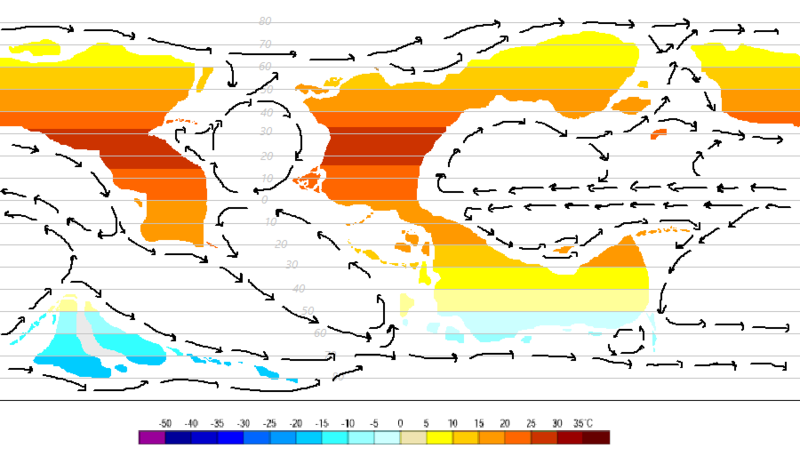 Moreover, no location in Sahara or the Arabian Peninsula is shown as having average July temperature below 30°C. Still, while some of the details do appear to be wrong, other maps like this one and this one show the same general pattern that Sal pointed out to me, which was the main point of discussion at the time, i.e. that the temperatures I had around the equator were too restricted in terms of latitude. 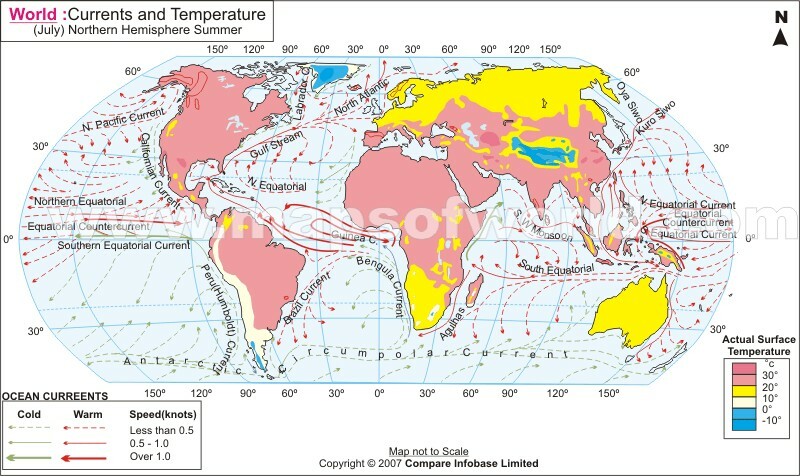 All three maps show temperatures of over 20°C covering much of the Earth's land between 15-20 degrees south of the equator and around 40 degrees north of it (with the roughly the opposite distribution occurring in January), with temperatures of 30°C and above occur much further north or south of the equator than I had placed on my map for Yantas. While the data of the first map might not be correct, the pattern indicated by other maps is what was most relevant. 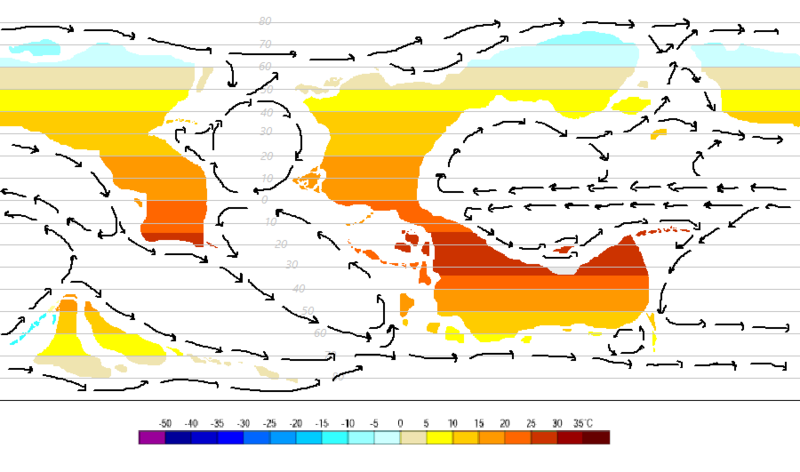 Here I've based temperature entirely on latitude. I haven't taken into account altitude or oceanic currents (although I have used the currents map I posted before so that we can see where they are, making it easier later on), so this is very very rough, as I mentioned before. The general plan is to have a single moon for Piranka, but the exact details of this are yet to be decided. The asteroid belt lies roughly 3.14AU out from Italva. 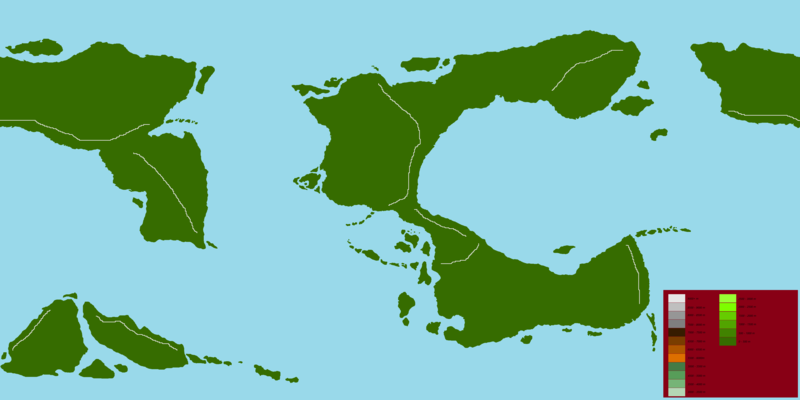 I've done some more work on the coasts and islands of Yantas, not much, but some, which you can find here. I've messed around with Velkasta, it was just too thin for my liking (which makes sense, given the projection), the north-eastern corner of Mistaya, the south-western portion of Sirden and the northern coast of Konyur and I think overall I'm a bit happier with the results than my original attempts. 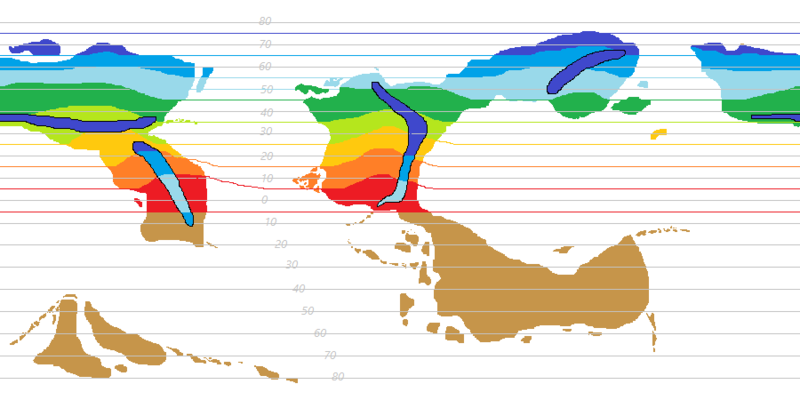 While I'm still working on actually finishing the altitude map of Yantas, I thought I'd post my work so far, which includes the heights of the various approximate maximum peaks (to the nearest 1000m) of the 12 major mountain ranges of the planet. terrific! your world is so good. keep working. maybe I need to work on the tectonic plate and the climate of my conworld(s) again. k1234567890y wrote: terrific! your world is so good. keep working. 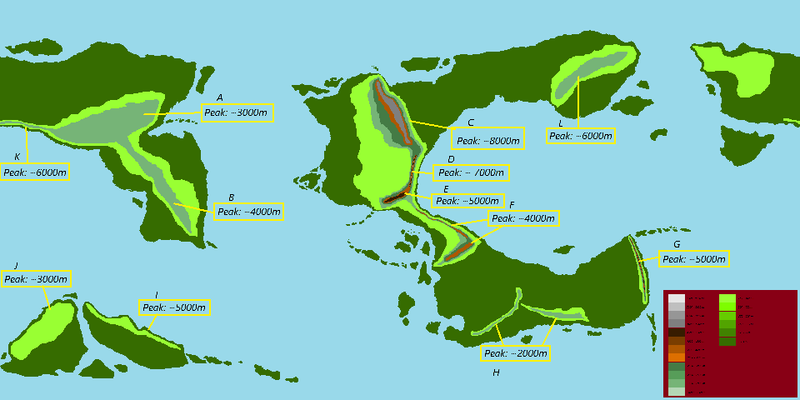 I need to work on the tectonic plate and the climate of my conworld(s) again. Thanks very much. The only problem I'm really having with the altitude map is where to place the various plateaus which Sal has suggested should probably exist. I'm reading up on them on Wikipedia however just to get a better idea of what I might do.